The only books by David Bergen that I have read up to this point have been The Age of Hope and The Case of Lena S.. Both were good, but neither one blew me away. So I was surprised when, upon reading the first few pages of Stranger, I was sucked right in. With its sensual, spare prose, I found the reading effortless and mesmerizing. Rumour had it that the Doctor’s wife was coming to take the waters at Ixchel. The clinic was located in the highlands of Guatemala, at the edge of the lake that was eighty-four thousand years old. You came for the lake, and for the beauty of the three volcanoes, and for the quaintness of the twelve villages that surrounded the basin of the lake, and for the afternoon winds that were thought to carry away sin. But if you were a woman who was infertile, you came to take the waters. Describing this book is difficult to do without giving the story away. (And if you want to avoid that I would also advise you not to read the book jacket.) So let’s just say it is about (in)fertility and motherhood, class, race, and gender disparity, power and entitlement. I felt instantly invested in the young female protagonist, rooting her on through the obstacles she comes up against. Although it felt very clear to me as I was reading who I wanted to “win” in this story, I am also aware that the situation is not black and white. There is a lot going on in this book – not just in the minds of the characters, but also legally, politically, and ethically. There was something about living in a country where the language was not yours. You appeared to be stupid and you weren’t noticed. Or if you were noticed, it was for your body, or to clean someone’s toilet, or to look after someone’s child. You turned into someone to chase or to scorn or to look down on. It was neceassry, wherever you lived, to have the poor so that everyone else felt better. Stranger had my attention from the very beginning, but at about two thirds of the way through this book, my heart leapt up into my throat, and at that point on I couldn’t put the book down. I had to see her through to the end, as though the end hadn’t already been determined. It felt like a thriller; one that made me think and moved me to tears. Her chest ached and she felt the ache and she knew for the first time what pure hatred was. It was entire and it moved sideways and forwards and backwards within her, and it was as if she contained the deep waters of an ocean that had been shaken by an earthquake and what resulted were mammoth waves, waves that could not be held back… She tumbled into hopelessness, and then felt anger, and once again hatred, and of these three emotions, hatred gave her the most pleasure… The hatred had been exhilarating. And welcome. And crippling. And exhausting. And very dangerous. For passion, anguish, jealousy, and anger would produce nothing but mistakes, and false steps, and failure. A cold heart was necessary. Stranger was longlisted for the 2016 Giller Prize. David Bergen is no stranger to literary awards – his books have been nominated for the Governor General’s Award, the International IMPAC Dublin Literary Award, the Margaret Laurence Award for Fiction, and The Time in Between won the Giller in 2005. For more on his accomplishments, his background, and what led him to start writing, visit his page at the Canadian Encyclopedia. Thank you to Harper Collins Canada for providing me with a copy of this book for review! An interview with Shelagh Rogers on The Next Chapter where I learned that this novel is set in the not-so-distant future. Have you read any of David Bergen’s books? What did you think? Great review. Can’t wait to get started on it. And it’s such a fast read – you’ll fly through it! I haven’t read any of his books but your review makes me want to try this one! This is a good one to start with! He has quite a few others if you like it. The passages you quote are so powerful! Love the writing – I am going to have to add this to my TBR. Fantastic review! Thanks! I hope you like it as much as I did. I found the writing style very effective. 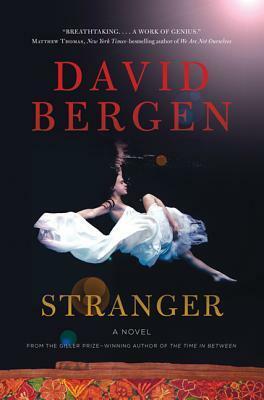 I can’t understand how I haven’t yet read David Bergen, not is he on my TBR list. I’m certainly going to read this one! This is a good one to start with! I also liked The Age of Hope. I wasn’t as impressed with Lena S., but there are a few others I haven’t read that you might find interesting. You always come up with books I haven’t heard of. It’s probably the Canlit focus. sounds like another one to add to my TBR pile!! Now I am completely intrigued! Great review of what sounds like a great book. The quotes are beautifully written. Never read him. Sigh, another TBR. Hopefully you’ll still find the chance to read it, Kim. It was good! One of the things that I really loved was the way that the prose style forced you to take time with simple details and gestures. I really loved The Age of Hope too, from the start and all the way through. I didn’t love The Matter with Morris at first, but it was one of those that I did appreciate well enough and then found myself completely and wholly involved emotionally towards the end, in a way that I wouldn’t have predicted earlier on (nothing which hinged on a plot point, I just hadn’t seen the slow build of character and how he was pulling me in). I had a ho-hum response to The Time In Between, which I now think I should reread because I think I might have missed something back then. I’m curious about Lena S now. Did you spot any similarities with it and Stranger and TAoH? It’s a little annoying when book jacks and blurb reveal too much about a book, isn’t it!? They really should be more careful about what they reveal there. This one sounds like a powerful and gripping read. The best books get us invested in, my personal favorites are the ones that move me to tears. I have to confess that most books move me to to tears at some point. Some more than others, though! Another good thing about this book is the setting. It might be my first book set in Guatemala. Okay so this one is about a Guatemalan woman who works at a fertility clinic? It sounds like it turns into a thriller. If it’s a page-turner, I think I’m game. Yes, yes, and yes! I’m not sure if it’s being marketed as a thriller, but I thought it read like one (for me).